Abstract - Live migration is a technology with which an entire running virtual machine (VM) is moved from one physical machine to another. Migration at the level of an entire VM means that in-memory state can be transferred in a consistent and efficient fashion. In pre-copy approach that is mainly used in live migration, total migration time which affect on the performance of VM, is prolonged by iterative copy operations and the significant amount of transferred data during the whole migration process. In this paper, we presented a framework that includes pre-processing phase in traditional pre-copy based live migration for reducing the amount of transferred data. In pre-processing phase, we propose the prediction working set algorithm. Applying the proposed algorithm which combined LRU (Least Recent Used) cache with splay tree algorithm, the system can reduce the amount transferred memory page. We evaluated the effectiveness of the working set prediction algorithm with various workloads. Experiment demonstrates that compared with XEN’s default pre-copy based migration algorithm, the proposed framework can reduce 23.67% of the total data transferred during migration and 11.45% of total migration time on average. Abstract - Grid networks provide users with a transparent way to access computational and storage resources. The creation of high performance Communication capabilities in multiple organizations and their interconnection in to a high speed fiber communications mesh have been described as Lambda Grid. We propose a modified ACO-based algorithm which can provided on-demand and dynamically light paths on a grid system. Indeed, the proposed algorithm can schedule jobs by discovering processing and network resources on the grid, assigning the job to a specific system and executing the job. We also propose a co-scheduling lambda grid system for job routing in optical grid networks, based on the concept of ant colony optimization, which studies the behavior of ants for gathering food and the routing of packets inside a network. Simulated results show an increased performance of our algorithms over more classical co-scheduling protocols, even though this is accompanied by a slight increase in complexity. Abstract - The scheduling problem deals with the optimal assignment of a set of tasks onto parallel multiprocessor system and orders their execution so that the total completion time is minimized. The efficient execution of the schedule on parallel multiprocessor system takes the structure of the application and the performance characteristics of the proposed algorithm. Many heuristics and approximation algorithms have been proposed to fulfill the scheduling task. It is well known NP-complete problem. This study proposes a genetic based approach to schedule parallel tasks on heterogeneous parallel multiprocessor system. The scheduling problem considered in this study includes - next to search for an optimal mapping of the task and their sequence of execution and also search for an optimal configuration of the parallel system. An approach for the simultaneous optimization of all these three components of scheduling method using performance effective genetic algorithm is presented and its performance is evaluated in comparison with the First Come First Serve (FCFS), Shortest Job First (SJF) and Round Robin (RR) scheduling methods. Abstract - Secure Real-time Transport Protocol (SRTP) provides confidentiality, message authentication, and replay protection for the Real-time Transport Protocol (RTP) traffic. There are common encryption algorithms that have been developed to protect data such as advanced encryption algorithm (AES). Chaotic encryption is new trend in cryptography based on chaos theory. Chaos is a class of complex behaviors that can emerge from nonlinear dynamical systems. A distinctive and readily observable property of chaotic systems is sensitive dependence on initial conditions. The main purpose of this paper is to propose an alternative scheme to provide confidentiality in SRTP using chaotic systems. The proposed scheme is implemented using Microsoft open source project for conference. The Chaos Based SRTP (CSRTP) is tested using StsGui NIST Statistical suite and Cryptool software  for security while Wireshark  is used for quality of service (QoS) analysis. The results related to CSRTP shows its superiority in terms of confidentiality and quality of service (QoS) compared with conventional SRTP protocol. Abstract - Grid is the collection of heterogeneous resources, providing good opportunities for the users of virtual organizations forming a Grid for coordinated resource sharing and problem sharing. Much Grid middleware software exists for implementing a Grid framework. Apart from many application areas of Grid Computing, Geographic Information System has been an emerging application area for Grid Technology in recent time. In this paper, the developments in the field of Grid-GIS are discussed after a brief overview of Grid Computing and GIS separately. Some observations are also discussed in the concluding section of the paper. Abstract - Ubiquitous computing introduces inimitable requirements for the discovery technique prototype, which lets services and devices become aware of each other without explicit human administration. The vision of ubiquitous computing has been described in terms of the disappearing computer. In this vision, we are free to focus on the interactions of daily life in various domain, rather than attending to the technology assisting us in those interactions, for example in UC discovery service technologies used in location detection and self therapeutic services in healthcare systems. The machine (while perhaps not literally invisible) becomes a tool much like a hammer or pen, easily appropriated and used as second nature. Discovery lets services and devices spontaneously become aware of the availability and capability of peers on the network without explicit administration. In practice, this means that a client can discover and potentially use a device without prior knowledge of it. Although discovery is a necessary component of ubiquitous computing, the wide range of discovery systems in use today reflects the varied needs of the communities from which they originated. Abstract - The growth of data communications has involved an increase in unauthorized accesses and data manipulation with the resulting security violations. Many methods have been developed to secure the network infrastructure and communication over the Internet. Since it is impossible to predict and identify all the vulnerabilities of a network, and penetration into a system by malicious intruders cannot always be prevented, intrusion detection systems (IDSs) are essential entities for ensuring the security of a networked system. An IDS is software (or hardware) designed to detect unwanted attempts at accessing, manipulating, or disabling of computer systems, mainly through a network. However, an accurate system that cannot handle large amount of network traffic and is slow in decision making will not fulfil the purpose of an intrusion detection system. In this paper, we present a layered framework for building intrusion detection systems which can detect a wide variety of attacks reliably and efficiently when compared to the traditional network intrusion detection systems. Another advantage of this Layer based Intrusion Detection System (LIDS) framework is that it is very general and easily customizable depending upon the specific requirements of individual networks. We, thus, address these shortcomings and develop better intrusion detection systems which are accurate in attack detection, efficient in operation and have wide attack detection coverage. Abstract - The value of a software system results from the interaction between its functionality and quality attribute (performance, reliability and security) and the market-place. The software maintainability is viewed considered as an inevitable evolution procedure driven through maintenance demeanor. Traditional product cost model have focused on the short term development cost of the software product. A Hidden Markov Model is applied to simulate the maintenance demeanor demonstrated as their potential occurrence probabilities. The software metric function is the measurement of the software quality products and its measurements results of a software product existence delivered combined to from health index of the software product. When the occurrence probabilities of maintenance demeanor reach certain number which is calculate as the denotation of worsening position of software product, the software product can be considered as obsolete. The longer time, more beneficial the maintainability would be. We believe on the architectural approach to price-modeling will be able to capture these concerns so that the software can reason about the risk I the system and price of mitigating them. Abstract - In this paper an Artificial Neural Network (ANN) based controller is presented for the Automatic Generation Control (AGC) of a five area interconnected power system with reheat turbines. The control scheme guarantees that steady state error of the area frequencies and inadvertent interchange of tie-lines are maintained in a given tolerance limit. ANN controller controls the inputs of each area in the power system together. In this study, back propagation algorithm is used as neural network learning rule. The performance of the power system is evaluated by comparing with conventional Integral controller. The ANN controller gives much better results as compared to that of Integral controller. Abstract - Since Wireless Sensor Networks (WSN) formulate the recent research into some advances to enable progression in the field of software and hardware technologies. Hence, in this research work, we study the performance and behavior of wireless sensor networks (WSN) in terms of effectiveness of system requirements on the resulting software architecture. As WSN currently faces a challenge due to rapid development in software technology and thus requires some new techniques for programming and tools. Abstract - Vehicular Adhoc Network (VANET) has attracted lot of research effort due to its applicability in the areas of road safety, infotainment and driving experience obtainable at a very low cost. Being a wireless network, issues in VANET domain include random packet loss in transport layer and in data link layer for a given end to end connection. The losses are dependent on the speed at which the nodes are moving within the network, the routing protocol used and the available channel. In this paper it is proposed to investigate the performance of Geographical Routing Protocol (GRP) under random mobility with voice and traffic. Abstract - During the last few years, there is a revolutionary development in the field of mobile computing, multimedia communication and wireless technology. 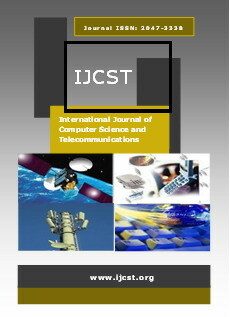 In this paper, we present study and comparative analyses of different technologies used for mobile multimedia storage and address different issues regarding its architecture and design; especially in cloud computing environment and suggest some solution for its improvements. Abstract - The dynamic nature of infrastructure in Manet makes security as a critical issue. The security of the network can be improved by preventing the black hole attack in manet by enhancing the data confidentiality and reliability . One of the way to achieve this is to protect the messages from being compromised when they are delivered over the insecure network .This paper focuses on protecting the data from compromised nodes by dividing the data in to multiple shares. Each message is encoded by a public key and then transferred over multiple paths. Destination receiving the multiple shares will integrate into original message. The optimal option of multiple path routing protocol is MAOMDV where the secret sharing schemes and message shares can be optimally allocated on each path to provide maximum security. The Algorithm is implemented on NS2 simulator. The results show that algorithm implemented on MAOMDV is more secure and provide high degree of reliability.